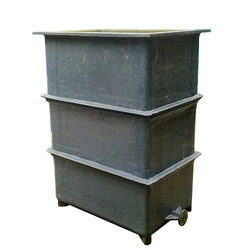 We are also manufacturing FRP Rectangular tank. These FRP rectangular tanks are made up of FRP/FRV material which is suitable for highly corrosive chemicals and withstand up to 120ºC in temperature. Our rectangular tanks are highly in demanded because of its based on international standard. We also supply these FRP rectangular tanks as per our client’s requirement and specification also. We are also manufacturing the FRP/FRV Rectangular/Square & Cylinderical vessels in FRP/FRV material suitable f or highly corrosive chemicals and withstand up to 120ºC in temperature.